I work free-associatively, without plans, to create paintings and sculptures. My ceramic work fulfills a curiosity about my characters outside the spatially dense environments in my paintings. In paintings, the figures exist to affect the composition of the ground and the ground exists to affect the composition of the figures. Through alternating color modulation and flatness in disjointed layers and repeating ambiguous imagery, I create game-like situations in which characters are in a state of becoming, causing paintings to seem self-aware. 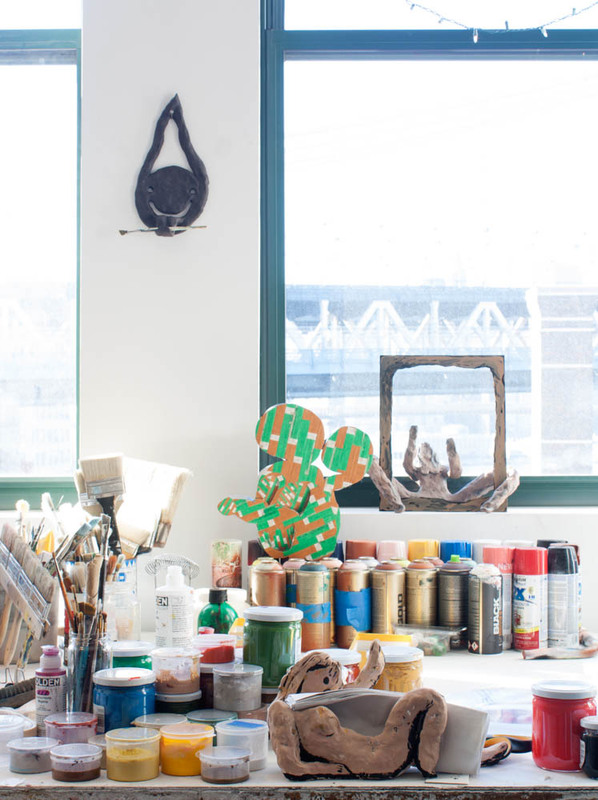 A shot of Bridget's studio at The Sharpe-Walentas Studio Program in Dumbo. Hi Bridget! Can you tell us a little bit about your background and what drew you to both painting and ceramics? I didn’t major in art in undergrad but I did take some art classes. I was more interested in going my own way than painting a still life. Outside of class, I’d cut up brown paper bags, tape them together and use the irregular surface to draw on. After undergrad I moved to Athens, Georgia and made music, ceramics, sculptures from found wood and metal, and I continued to work on large wall drawings on collaged brown paper bags. After 4 years in Georgia I went to grad school. It was then that I developed a consistent studio practice. After grad school in Boston I moved to New York and worked free-lance doing art installation at museums for 8 years with some breaks for residencies. Last fall I returned to New York after a string of residencies lasting 3 years. What draws me to make art is the possibility of revealing my unconscious through a visual manifestation. Painting seems more mysterious to me than ceramics. With ceramics it’s either object or air, the form is a fact. Sculpture is a bit unsettling to me, the obviousness of it, but that’s also why I’m drawn to it. The insertion of gravity into a vision is an interesting construct, the way the perimeter of a painting is an interesting construct. Have you noticed that Minnesota has had any active effect on your work? I’m sure it does but I have no idea how! I currently have a studio that looks out at the Manhattan Bridge. When I moved in many people asked how I thought that view would affect my work. I couldn’t imagine it would affect my work in any conscious way. Now I see triangular shapes in my paintings and wonder if they were inspired by the structure. Perhaps even the characters I paint could be read as the commuters inside the train traveling over the bridge? Recently I had a studio visit with a friend, also a painter from the midwest, and she was wondering if artists from the midwest were more modest and whether they tended to make smaller paintings because of their modesty. I had been making smaller paintings because I’ve been moving around so much, so it seemed like more of a practical decision for me, but I thought it was an interesting question. Basically, I can’t ever be sure why I’m really making my decisions, especially whilst in the midst of choosing. Perhaps that question will be better answered in 20 years, when I have a greater body of work and and more of an objective perspective on how I’ve related to all the different places I’ve lived and have had studios. In what ways have you noticed your work evolve over time, or perhaps how has your relationship to it changed? I made collage work on tar paper and brown paper bags for 14 years. I worked from a giant pile of cut-off negative shapes and other paper scraps to make free-form collages that hung on the wall. I think my imagery is still similar—I’ve always made cartoonish figurative works—but now my imagery is within the confines of a rectangle made with layers of paint rather than layering physical material. Introducing the construct of a rectangle has provided a much needed psychological confine and has also made me more considerate of scale and space. Because of my history with collage, I tend to think of paintings as sculptural objects and my imagery is always conscious of that. Characters bend to fit into the frame, drooping flowers hit the bottom canvas edge as if it’s the ground. How is your relationship to your ceramic work different from your relationship to your paintings? In my ceramic work, there is no environment, the entire thing is the character. That makes the physical space around the ceramic work, the wall or wherever it rests, seem contingent. I have a hard time with this context—this feeling of a character inserted into our physical world. It often makes sense that my ceramic works have some sort of found object insertion—some kind of gateway into the otherworldliness of the ceramic work from our human space. In the past that gateway object has been a rock, a pane of glass, napkins, a paintbrush, a flower, a kiwi. In paintings, there is more ambiguity between characters and their environments, things are more mutable. The abstract environments absorb the ambiguous forms. I appreciate the clarity of my sculptures and the particular challenges that they bring, but my paintings have a way of possessing me— in the process of making them and then after they are completed. I think the possession has to do with sustaining uncertainty, and refraining from narrative in the midst of a figure in an environment. You’ve said that you work free-associatively, but can you take us through your creative process, or perhaps the mental movements that precede beginning a new work? I decide the size of the canvas and build it, or find a canvas I was working on some months or years back and re-engage with it. I don’t make a sketch or have an idea of what I’ll paint when I start out. Starting a painting usually means laying down abstract marks that relate to the proportion of the canvas and using colors that relate to the raw linen or the images already painted. I work formally, without naming the things I’m painting, and letting surrounding colors dictate new colors and surrounding shapes dictate new shapes. At some point I start to see how figures, which lately are inevitable insertions, come to fit with the composition. Figures are built in response to formal elements; they are conscious of their surroundings and often get hedged into positions by the abstractions or the confines of the canvas. In this way narrative is almost a by-product of the painting, a consequence of abstraction, and something I’m only partially, consciously aware of. The entire process is off-the-cuff, and I don’t always accept each mark as fitting. Sometimes things need to be painted over or altered— often the past “failed” attempts at figures or compositional elements become part of the composition. The whole process is one of freedom from pushing a known content, a way of glimpsing intention out of my peripheral or perhaps unconscious vision. Working this way allows me to step back after the painting is finished and, like a spectator, discover the possibilities of narrative. There is an inherent relationship between what I do with the painting in the process of making it and what you do with the painting in the process of seeing it. Are there any reoccurring themes that you keep coming back to? Any color palettes or moods? Are there any concepts that you’re excited to explore and haven’t yet? Repetition is a big part of my work. There’s something about the infinite that makes me both panicky and giddy. In solving the problem of what to paint, the choice to paint what you just painted might be obvious or even dumb but it’s hardly ever the same way twice even when that’s your intention. Through repeating a figure I can sketch out the full nuance of a character in the sum of many, I can show one character moving through time, and/or I can create an army. If a character’s body has a slight difference in position than the one next to him/her, a suggestion of movement akin to stop motion is implied. If characters seem to possess no difference, their shapes unaffected by the canvas’s perimeter, they may read as infinite, like wallpaper. How the figure occupies the space and if and how they connect to one another are considerations that change the content. Your paintings work with space in a really specific and interesting way, almost working in tandem with the figures (I’m thinking in particular of Forgettable Sunsets) to create a dynamic relationship between the two that makes one dependent on the other. Can you talk a bit about the way you work with space in your work, and how it relates to the figures that also exist in your paintings? It’s important for me to make not only the relationship between figure and ground contingent but the relationship between the ground and the canvas contingent as well. I made collage work on paper for 14 years, with the shape of the character or environment determining the shape of the paper, which usually meant no hard edges. This sensibility has transferred to my works on canvas, linen, and panel. The rectangle never feels arbitrary; it’s always a choice. 4 years ago I consciously decided to work within the rectangle to see how the introduction of a construct might free up my process even more. I’ve lately been introducing the construct of a void, or an unpainted realm to a few of my paintings. I see this idea as another necessary corner I’ve painted myself into, of which I must paint myself out. You have said that you “create game-like situations in which characters are in a state of becoming, causing paintings to seem self-aware.” Could you expand a bit on that? The repetition, ambiguity of forms, and ambiguity of the sentiments of the characters, create a puzzle. The shallow space that the forms and characters inhabit is a mutable, flexible space akin to the screen-like spaces we often interact with. When I look at a completed painting I’ve made, I like to be made to feel that the scene is provisional, that I can suppose a character is in an imagined field that I am capable of visually rearranging. Perhaps this is a field of ideas that hinges on naming the more obvious elements so that the parts of the painting that are ambiguous can be many things at once. I like to think of my characters as being the pivotal moments in the paintings from which to depart. Because my paintings are built from a series of contingent decisions, it feels as if in the process of making, the painting is pushing me away and starting to stand on its own. There reaches a point when it starts to become mysterious to me and seems full of possibility and I no longer want to paint it, I want to look at it! That’s how it becomes self-aware, when it no longer needs my assistance to become something; it possess enough. It’s not so much about finishing the painting, it’s about bringing it to a point that is still full of becoming. Since much of the content of the painting is revealed to me slowly over my experience of seeing the completed painting, it feels as if it is perpetually becoming. It seems as though there’s a conversation happening between the abstract elements in your work, so much so that they are no longer abstract, but a part of one syntax—one seemingly distinct element actually in a relationship with the rest of the work. Would you say that’s accurate? I like thinking that is a possibility, yes! Elements in the painting can go in and out of abstraction once surrounding elements get defined. I don’t want to always define the elements in paintings in terms of either figure or ground, it’s more flexible than that. The idea that the abstraction might absorb the figure if seen in a certain light, or that the viewer could build the figure with the abstract elements really interests me. I would love to talk about your use of material, particularly in how it relates to texture, and ask what your intentions are when it comes to using specific materials (layers of acrylic paint, for example) over other materials, since it seems so highly relevant to your work. My current paintings on linen I see as evolving from my collage and sculptural work. When I used to make collage I relied on the juxtaposition of abutting papers to create content. Now, in my paintings, I do the same with layers. Often I mask out sections of the painting with opaque tape and paint or spray paint over the surface, making marks in a half-blind sort of way, not sure how the marks will interact with the masked out painting underneath. I find this way of letting go of driving the content actually builds content in much more interesting way. It has always been important that the material I work on have a history. When I started making art I was using brown paper bags, tar paper, and found materials as the starting point. And now I’m very interested in linen for similar reasons. It already has so much presence; the visibility of the weave and the diversity of color in the weave remind me that the materials I choose to work with are collaborators in my process. My practice of painting open layers atop open layers is another way of working with an already established ground, a history. I recently finished painting on panel that I had been working on-and-off for about three years. I just kept working hoping the accumulation would add up to something. Eventually I did the opposite of what I usually do, I painted over the whole underpainting with new imagery. The history of the painting underneath was still present in the thick paint build-up/ridges of paint. I took a palm sander to the surface with intention to sand it and repaint the surface, but once the sanding was done, those ridges revealed the history of colors underneath. Instead of those ridges reading like reductions, they read like additives, like painted marks. They ended up working compositionally and with the content. The weathered, sanded surface countered the floating hearts above happy-eyed characters. On the subject of materials, can you talk about the presence of the flower in your piece Loop? I was at a residency I had been at for six months and was leaving soon so each day I felt as if I was slowly fading from the place. While at the residency, I had made many different ceramic heads, all similar to the one in “Loop,” and linked them together to form a chain, with one hanging off the tongue of the one above it. At one point, I took a single ceramic head and rested a paintbrush in the curl of the tongue (so it became a brush holder,) and then weeks later I hung from the tongue a clear grocery bag with Valerian and a kiwi in it (so it became a hook.) About a week before I left, I found a flower in a garbage pit. It was on its way out too and had this comical arch as if gravity had become too much for it and it was heading back to the ground. I liked the way when paired with the ceramic work’s cookie-cutter smile, the dying flower would read as a frown. It was also a formal decision, a counter move— a downward arch to the upward arch of the smile. For the past 6 months at the residency, the drooping flower in place of a mouth had been a prevalent symbol in my paintings. Pairing the ceramic sculpture and the physical flower weren’t a plan from the onset. I think they came together as a gesture of farewell and sweetness to the other artists at the residency that had become friends. You refer to the figures in your paintings as ‘my characters.’ Are the same figures that are a continual presence in your work? What is your personal relationship to them, as in, do you feel as though they are representative of you personally or are they strangers? What are the benefits of painting the same characters repeatedly? Good question! I usually don’t go at things head on. Meaning: I’m not really sure what I’m going to do with each painting until I’m doing it. The same is true for my characters. They emerge from formal elements. Yes, I decide how to interpret those elements and there is a likeness from one character to the next; I suppose that is my style. I’ve always worked in a cartoonish way. There’s something about cartoonish figuration that seems more capable of being both sinister and playful, exuberant and melancholic, flippant and potentially meaningful. I enjoy this oscillation between polarities. My characters are, to some extent, myself. I paint what I feel and what my hands are capable of doing. They come out the way they do largely because of the formal elements I am considering as I’m working. I’m not naming what I'm doing as I'm doing it. The benefits of painting characters repeatedly? It’s interesting to see how changing small nuances from one character to the next can change the whole vibe of the character. Does a longer face make someone seem more pensive? Does someone missing one eye make them seem more aloof or cooler? I know that you’ve done a few residencies such as at the Skowhegan School of Painting and Sculpture and at the Fine Arts Work Center in Massachusetts. What are some of the things that draw you to residencies, and what do you feel are some of the advantages, personally and professionally? Moving to new places to focus on my art is a way to face the very common, daily occurrences of confusion and fear. I think it’s thrilling to be unknown in a place and have to work to re-establish my identity through getting to know other people. Every time I’ve moved to a new place, my work seems to change too. In these new situations, I find home in the space of painting. The feeling of being unsure in a place or timid with new people is starkly contrasted to the isolation of the studio and the comfort of no outside judgements. That isolation is something I’ve always been able to sink into easily. It can make me feel wild in the studio. Skowhegan is where I started painting in silence. I think the intensity of being there, particularly the highly social aspect of the residency, amplified the need to go inward. I needed to have a space without an outside source directing my thoughts. It was calming to be aware as each thought came into my consciousness and how it could turn an emotion on. I worked in silence to feel closer to myself but also to be more aware of the moments of choice in painting. What’s a normal day like for you? Are you a person of routine? I don’t like routines because then it feels as if I’m doing something out of habit rather than intention. Even brushing my teeth is done at a different time every morning. I try to do things when I want to do them instead of doing them out of routine because I think that makes those practices more meaningful and beneficial. I’ll do a better job brushing my teeth if I want to do it. Because I try to want to do everything, even routine tasks, I have to minimize the things I do in the morning so I don’t overwhelm myself with choices before I get to the studio. A normal day is going to the studio from 10-7 then going to an opening or dinner with friends. I also work at a gallery a few days a week, but I don’t think of that as a normal day. Do you look to other artists for inspiration? Or do you find that your creative process is renewed by looking outside of the art world? Or both? Sure! Both! I am part of a crit group that is really inspiring. The people in the group are generous with their time and about sharing their insights into each others work. My creative process is also renewed by traveling to places I’ve never been and talking with people who seem to be searching for something. Who are some artists that have influenced your work, or even inspired you to turn in a new direction? 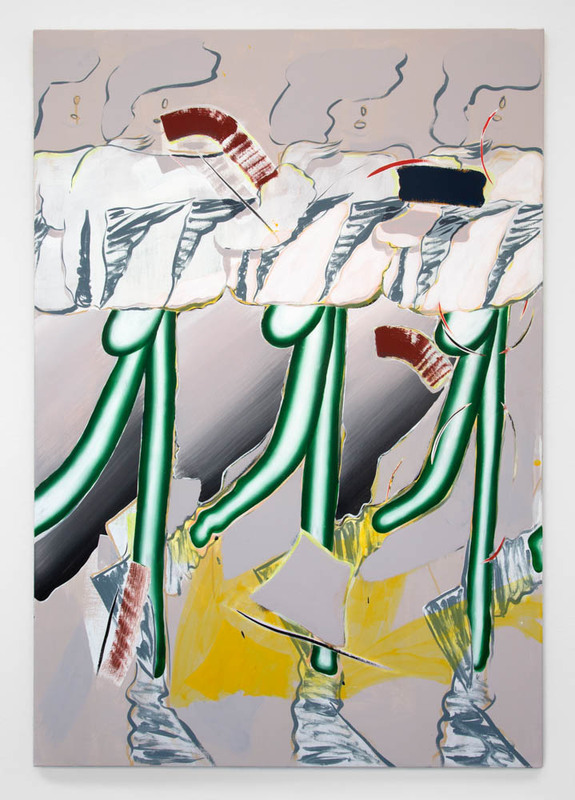 I love the way Charline von Heyl makes choices. Alan Watts helps me clarify my thoughts. Dana Lok and Roger Brown are masters of repetition. Ahavani Mullen inspired me years ago to start painting again. What are you reading? What are you listening to? What are you watching? Reading Freedom is a Constant Struggle, listening to Paul McCartney, watching Baskets. What do you do when you need a break and have to let off steam? Go to Fishers Island and harvest clay. Can you tell us a little bit about your studio space, and how you like to get work done? What are some of the things that are important to you in your day-to-day process of being in the studio—for example, can you work among chaos or do you need to have everything in its place? The space of studio feels like an extension of myself. When I’m working on something that space of extension gets even smaller—it’s between me and the painting or clay and everything else disappears. It’s a space of intention / attention / focus. I like to have the spaces I inhabit feel and smell a certain way. I like have plants around and I like that my spaces smell like I do, which is to say they smell neutral and not noticeable to me. I love when my friends come to my house or studio and they say it smells like me and I like going to their places and knowing them through their smell. What fascinates me is the fact of that experience, though non-verbal. It’s like a vibration in some nearly intangible register. Is there anything that really sets the mood in your studio? My family and friends and people soon to become family and friends. What is your personal relationship to social media? Do you find that it supports your work, and your growth, or that it’s dangerous to your creative process? Do you use it for solely personal reasons or for professional reasons as well? I look at Instagram to see what my friends are experiencing and to introduce me to new artists. Instagram has exposed my work to people who might not have already been aware of what I’m making. Of course then that first contact via Instagram is followed up by a studio visit because the only way to see work is in person. Generally speaking, in your opinion, what are some of the benefits and detriments of social media in relation to the art world? How has technology changed things, even in the last few years? The benefits are that I can see tiny, flat, illuminated images of what other people are doing and making. It’s imperfect, but still interesting and it gets me intrigued to go out and find the real thing. The determents are that social media can be addictive and you can forget that the image is just a representation and not the actual work of art. Are there any accounts that you follow that you love? My sister’s account, my brother’s account, and babyanimalsco. I was invited for a month-long residency in Madrid for next winter, I have a solo show at the Lighthouse Works on Fishers Island in the fall, and this summer I’m in a group show at DC Moore Gallery called ZIG, ZAG, ZIG. To find out more about Bridget and her work, check out her website.